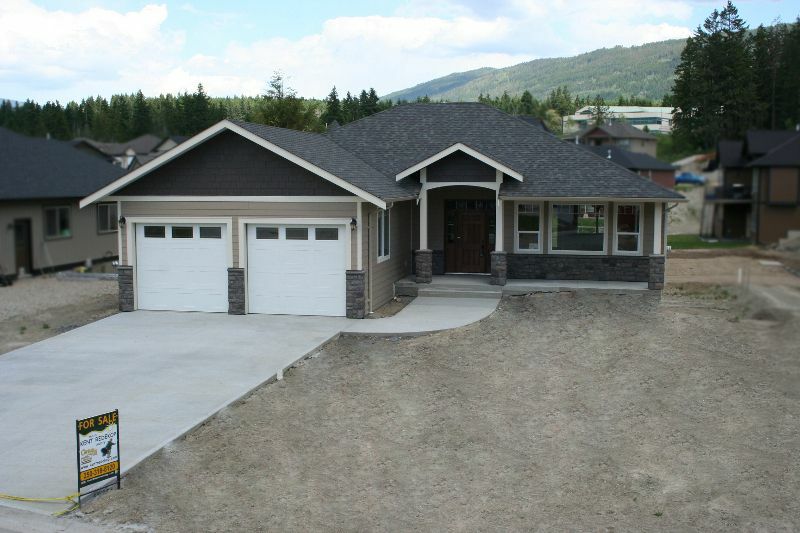 Best Value in Salmon Arm's New Home Market! "BRAND NEW" Now Completed, Open Plan Rancher with Walkout Basement offers 1662 SqFt on Level Entry Main Floor with Hardwood Floors, Maple Cabinets, 9 Ft Ceilings, Gas FP, Tiled Bathrooms, Laundry & Large Tiled Foyer with double door coat closet; Full 4 Piece Ensuite with Soaker Tub & Large walk-in Shower; 3 Bedrooms up with plenty of room down; Large Dining Room, Built-in Shelving; Covered Deck, Sundeck & Veranda Porch in Lakeview Meadows Sub-Division where your kids walk to Schools & Parks! Huge Kitchen with Corner w/i Pantry & under cabinet lighting; No maintenance Hardi-Board Siding with cultured stone features, Double Attached Garage, Concrete Driveway & Walks. High efficiency two stage furnace, walk out basement has electrical roughed in with full insulated exterior walls. The home has been professionally staged with furniture for your viewing pleasure; Come have a LOOK! Call Rob Today; YOU'll be glad YOU did.